Our Christmas Spectacular takes us back to the ancient splendor of Rome with feature stories on Remco's Big Caesar, that fabulous big battery operated ship from the 60's "complete with two armies." 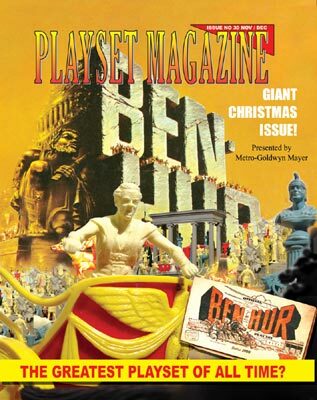 Our cover story is the Ben-Hur playset, colorfully laid out for the centerspread too. For the first time ever, you'll see beautiful color photos of all three sets in this awesome line of sets. Readers are surprising us with their choices for "The Greatest Playset" - a new column written by them about their favorite sets. We're printing them all, and they start this issue. Next, there's a follow-up to The Untouchables in our "Out There" section. This time it's never-before published shots of the actual prototype at the Marx offices and the tin is all hand-painted. You may enjoy picking out other differences from the production set as well. There's also report on the Morphy action with prices that prove this hobby is only going "Up and Forward!" Perhaps our most anticipated story this issue is the official Old Toy Soldier report with details on the most fun event of the year, plus several pages devoted to the newest sets now in production: Ron Barzso's SHORES OF TRIPOLI, Toy Soldiers of San Diego's new TARAWA ATOLL and Richard Conte's BLOODY OMAHA, plus the new Alamo Mexicans from Imex and even a report on the newset Ben-Hur DVD boxed set.